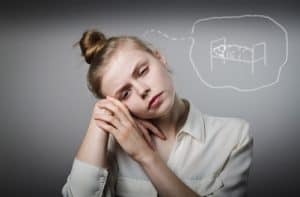 More than a third of people sleeping on natural latex mattresses report a noticeable reduction in pain. Latex soothes painful points because it exerts low pressure. This reduces the pain you are experiencing, but also mitigates future bone and muscular problems. Natural latex mattresses provide suitable support without excessive pressure, allowing your spine to align properly. This is one of its top advantages. It’s really a naturesend and one of the few materials out there with the fewest chemicals possible, none of which are toxic. Virtually all other types of mattresses release certain chemicals as they get older, which increases pollution levels in your bedroom. Organic latex mattresses are the best of the best, because only organic fertilizers are used for the latex-producing trees and no herbicides nor pesticides are allowed. This eliminates any potentially harmful substances from coming into contact with you in your sleep. Natural latex is inhospitable to dust mites, mildew and mold, which can all be very problematic for everyone, not just people with asthma and allergies. 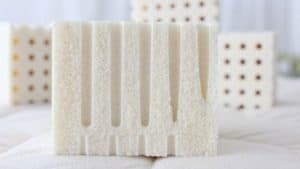 Natural latex mattresses excel at motion isolation. This is crucial for couples. It means that movements on one side of the bed, such as turning around and getting up, reflect minimally on the other side. If your partner is a light sleeper who tosses around frequently, you can rest assured you won’t feel it. Different layers can be applied in order to get a certain feel tailored specifically to your preferences. If you and your partner cannot agree on the level of desirable firmness, you can even have a mattress with one super-firm side and the other plush. If you get a mattress with no glued parts, you can even replace upper layers to refresh it and prolong its life. If you’re tired of having a saggy mattress after having your mattress only a few years then you want to look into a Natural latex mattress. You can depend on a latex mattress to last about 2-3 times longer than the traditional one sided or memory foam or poly-foam mattress. If you put the cost of purchasing a natural latex mattress in long term perspective, it’s an obvious pay off. It’s a high-end product that will eliminate the need for frequent changing, will provide you a natural and supportive surface for all that time. This is important for everyone, regardless of your sensitivity to smells. 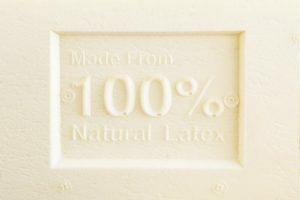 All-natural latex releases virtually no smells or gases. This is because very few chemicals are used in the production process. If you happen to smell something, most consumers say it’s a very faint and inoffensive smell. Natural latex mattresses are growing in popularity because of their eco-friendly properties. Latex is harvested from trees without hampering their growth and well-being. They continue to process the air, and produce oxygen, which reduces air and water pollution. Latex trees live for 30 years at times, and in the cases of organic growing, no pesticides are used, preserving the soil as well. On a broader scale, this ensures biodiversity is conserved.